The benchmark in the ISPS Handa Premiership continues to be set by the leading duo of Auckland City and Team Wellington while the Canterbury United Dragons have resurrected their season and Southern United continue to climb the table after the fifth round of action this weekend. Auckland and Wellington both secured comprehensive victories – over the Wellington Phoenix Reserves and Hamilton Wanderers respectively – but the margin of victory was much tighter for Canterbury and Southern, who both came from behind to defeat Eastern Suburbs and Hawke’s Bay United. 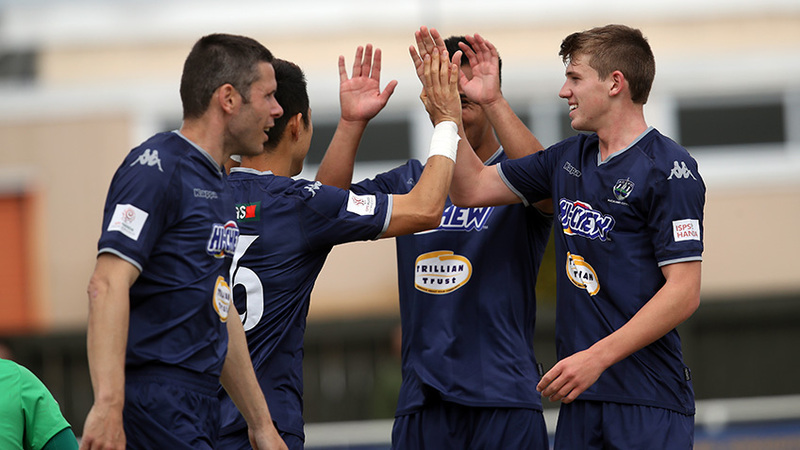 The round kicked off in low key fashion on Saturday at Trafalgar Park in Nelson as Tasman United and Waitakere United were both looking to bounce back from defeats but couldn’t fully do so in battling to a scoreless draw. The hosts were presented with a chance to earn a late win when Waitakere were reduced to 10 men for the final moments, Nino Lacagnina receiving his marching orders in the 84thminute for a second bookable offence. But they could not capitalise and were left to reflect on a third consecutive week without a win. While frustrated at his side’s inability to find the net, Tasman coach Davor Tavich felt a loss for either team would have been harsh. The scorers were kept far busier today in a goal-laden set of matches. The action began with an early kick off at the latest ground to host ISPS Handa Premiership football for the first time, Sunnyvale Park in Dunedin, but it appeared initially that the change of surroundings had not had a positive effect on Southern. Hawke’s Bay travelled south in possession of the league’s only unbeaten record and looked on course to keep it when Alex Palezevic gave them the lead in spectacular fashion, thumping an unstoppable strike past Liam Little from 25 yards just before the break. But, just as they had a week earlier to secure a dramatic win over Waitakere, Southern came back into the game late on. Firstly, Andrew Ridden equalised with a looped effort over Ruben Parker with just under 20 minutes remaining and it then got even better for Southern with one of the last kicks of the game. Parker pulled off a double save but could not manage to keep out the third attempt from Garbhan Coughlan as Southern were again able to claim a last-gasp victory. Southern may soon have competition for the tag of comeback kings though as Canterbury pulled off the same feat at home to Eastern Suburbs. Yet to post a win and rocked by the recent withdrawal of talisman Aaron Clapham, nothing less than three points would do for the Dragons at English Park in Christchurch. But it seemed there was little chance of that happening as Suburbs raced into a 2-0 first-half lead through Jordan Vale and Derek Tieku. The hosts were still facing a two-goal deficit as the clock ticked past the hour mark but the comeback was soon on as James Pendrigh laid the foundations with a free kick from just outside the box. Stephen Hoyle then brought his side level with seven minutes remaining before notching again deep into stoppage time to claim a vital win. Auckland City FC also put in a strong second-half showing up at Kiwitea Street, leading 1-0 at the interval through an Emiliano Tade goal before blowing away the Phoenix – who were able to include senior professionals Hamish Watson, Adam Parkhouse and Lewis Italiano – with a rapid-fire burst of net-busting midway through the second period. Daewook Kim’s well-timed run saw him shake his marker and meet a 65th-minute Tade corner with a firm header and the dust had barely settled when the visitors gave the ball away in front of their own area and Fabrizio Tavano was put through to make it 3-0. Tade then compounded the misery for the Wee Nix by sneaking a shot under the body of Italiano for the Argentinean’s eighth ISPS Handa Premiership goal in his last five games. While late drama and improved second-half performances seemed to be the order of the day, that trend was bucked by Team Wellington as the defending champions travelled to Hamilton Wanderers for the round’s live televised match. The visitors were obviously inspired by the cameras and charged into a two-goal lead before Wanderers had barely had time to catch breath, Angus Kilkolly striking twice in the first eight minutes. He completed his hat-trick with a header on the stroke of half-time but there was somehow still time for Hamilton to give themselves a glimmer of hope before the break, a low Armin Pasagic effort striking the foot of Cole Peverley and looping agonisingly over a stranded Scott Basalaj in the Wellington goal. But, unlike elsewhere, a full fight back didn’t materialise and there was no further scoring in the second half as Wellington joined Auckland at the top of the table and cellar-dwellers Wanderers were forced to continue their search for a first win.